K9 Swim Hydrotherapy and Wellness Centre is an aqua facility for dogs in North-West Sydney founded by veterinary nurse and muscle therapist, Sharon Osmond. She realised there was a need to assist dogs recovering from injury or suffering from chronic conditions such as arthritis or obesity, to build up muscle in a non-weight-bearing environment. Sharon, the founder of K9 swim with a cuddly client. Sharon achieved the Level 3 Certificate and Diploma in Hydrotherapy for Small Animals from Greyfriars in the United Kingdom. Photo credit: K9 Swim. Dogs visit the centre for all sorts of reasons, such as pre and post surgery or disabled canines who require rehab, seniors who find buoyancy of the water easier on their joints, as well as otherwise healthy dogs who swim for fitness and fun. 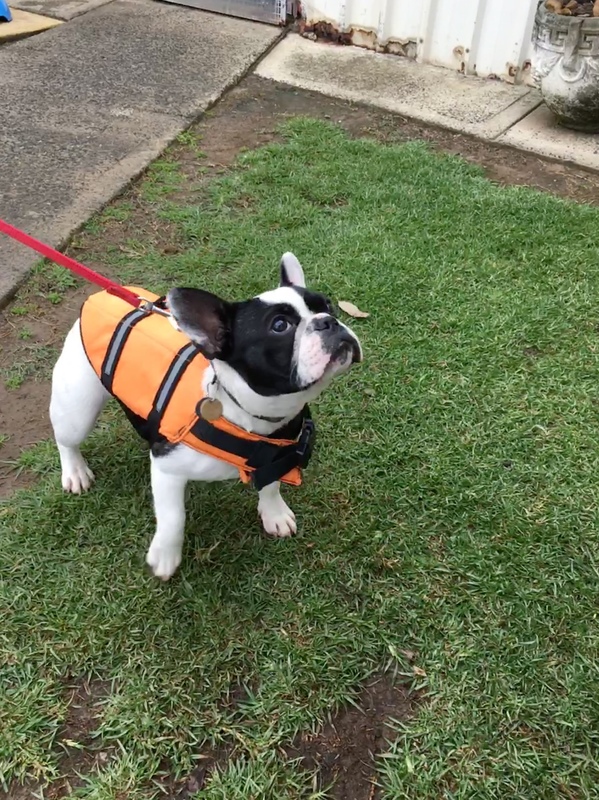 Mochi-Pickle trying out her life vest on dry land before taking the plunge. Photo credit: Nicole James. I didn't realise before I owned a dog, that not all breeds of dogs are naturally strong swimmers. My Frenchie is one of those breeds who needs a little extra help. Mochi-Pickle's first swimming lesson in the purpose-built doggy pool, with instructors Brooke and Ashleigh. Photo credit: Nicole James. There is an 8-week weight loss program for dogs who are on the portly side and a 6-week Puppy Splash program for pups to learn to socialise and be confident in the water. The cost of the puppy splash program is $110 and the next one is September 2018. Fill in the online form to register interest. Perfecting the art of doggy paddle at Puppy Splash. Photo credit: K9 Swim. Each session of Puppy Splash is at 2 pm on Saturdays and lasts an hour. Class size is about six to eight puppies and activities include time trials and mini races. Each week will build in duration and stamina as the pups grow in confidence. All dogs initially go in with a life vest. After the trainer assesses them, they can go in without a life jacket. Puppy Splash is an excellent way for dogs and pawrents to bond. For a full list of programs available at the centre click here. 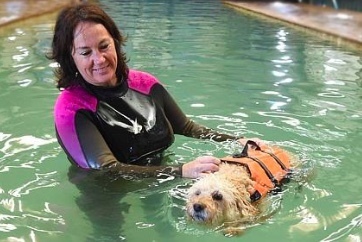 Dogs are provided with a buoyancy life vest for each swim session. Life vests and rain jackets are available for sale. Photo credit: Nicole James. As the next Puppy Splash program is a while away in September, I tried a single session. My dog is a brachycephalic breed with a short snout, so the first swim was limited to 10 minutes to ensure she didn't overexert herself. 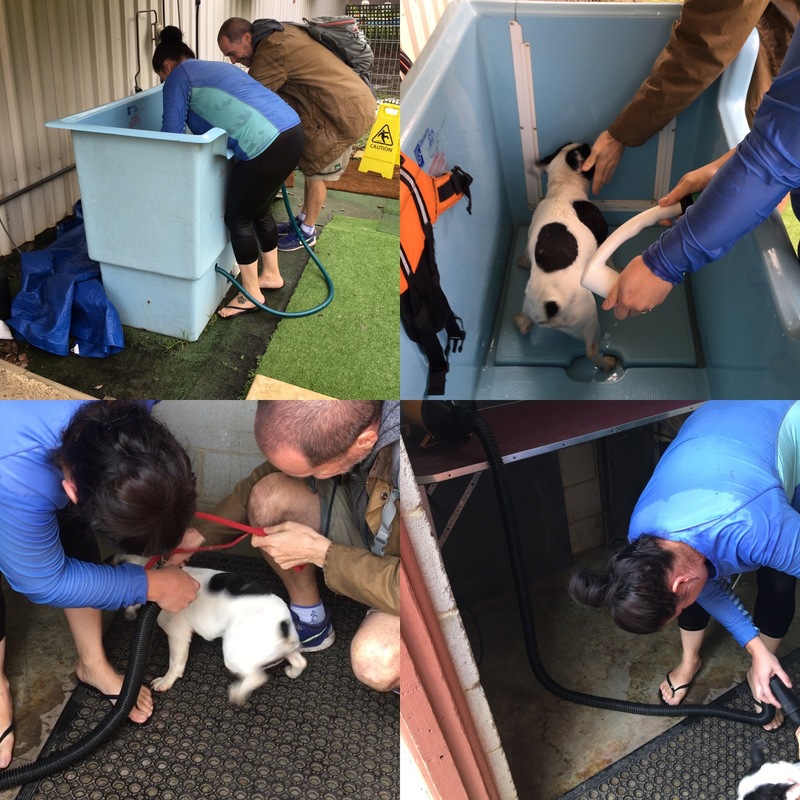 Safety is the top priority of the staff and Brooke and Ashleigh, the canine hydrotherapists who instructed my puppy (and me) were patient and did an excellent job. Brooke and Megan are passionate about their jobs and have a genuine love for animals. Photo credit: Nicole James. Including registering my puppy, chatting with the staff, the swim itself, the warm water rinse and commercial dry-off, the session lasted 30 minutes. The drying room doubles as a changing facility and there is a public toilet 100m down the road. Post-swim chlorine rinse-off with warm water and a blow-dry with a commercial dryer. Photo credit: Nicole James. For the first swim, the instructors take the dog in the pool while the owner stands at one end and calls out encouragement to motivate their dog to swim to them. On subsequent swim sessions, owners are encouraged to get in the water with their pooches to learn the ropes. The idea is to pass on knowledge and get owners comfortable with the process and eventually take the lead. My friend asked me why I couldn't just take my dog to Rose Bay for a swim and yes, I could, but this is a calm, controlled and heated environment that ensures no sudden muscle cramp and is also a learning place for both dogs and humans. Additionally, for older dogs, or those doing physiotherapy exercises, the warm water aids blood circulation. There is a ramp at the side of the pool for easy access. Photo credit: Nicole James. At the time of writing, K9 Swim operates at two centres, swimming lessons at Londonderry and another clinic in North Richmond, a 15-minute drive away. This second clinic is where photonic treatments (similar to acupuncture) and underwater treadmill sessions are held and a Canine Osteopath and an Alternative Vet are also available for consult. Other complementary therapies offered include herbal remedies and doggie massage. A brand new doggy pool is being built at the North Richmond centre and will be ready in time for the next Puppy Splash program in September 2018. For a complete price list, contact the centre on 1300 787 064 or email them here. 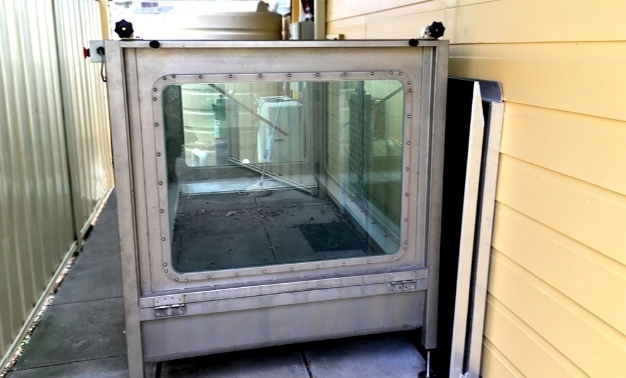 K9 Swim's Underwater Treadmill for Dogs. Photo Credit: K9 Swim. 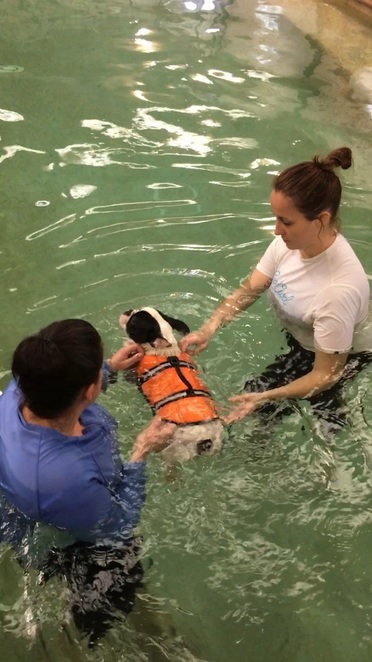 If your dog is recovering from an injury and needs to build up muscle in a supervised environment with a qualified vet nurse or canine hydrotherapy expert, or even for general cross training fitness and fun, give K9 Swim a go!